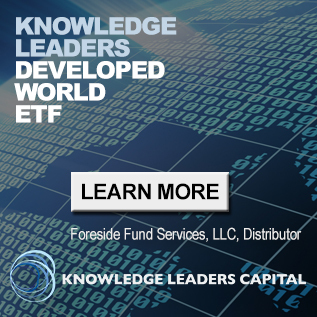 Yesterday’s stocks reacted to a raft of overnight foreign economic data that it perceived positively. In this note, I’ll run down the data and my doubts about that reaction. The hits began with China’s Markit manufacturing PMI jumping to 50.5. 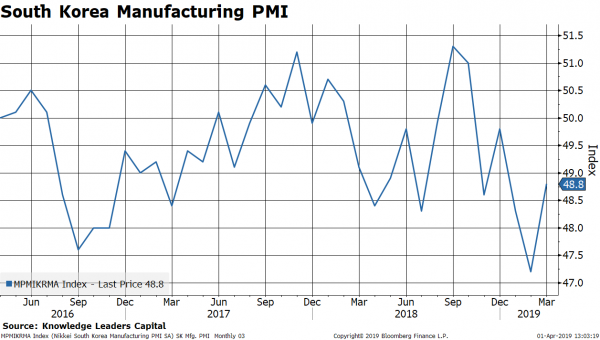 While the media seems to focus on the size of the jump, and the fact that it came in .6 points better than estimates, the reality is that at 50.5, manufacturing is barely expanding. 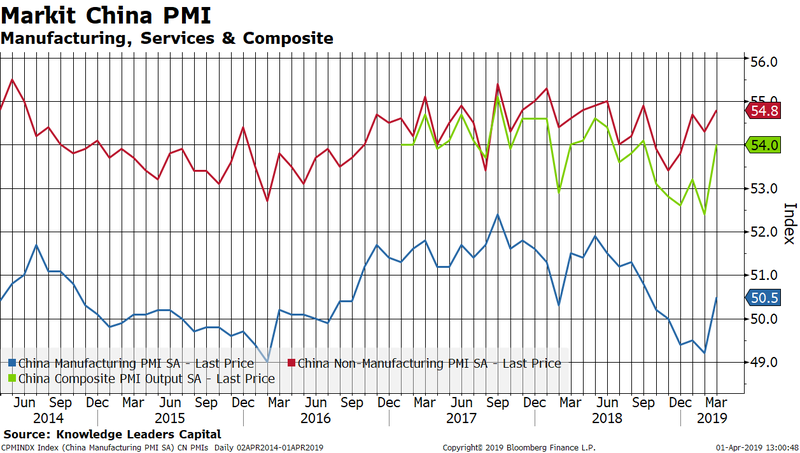 Next, we got the China non-manufacturing and composite PMIs, which also showed increases. The non-manufacturing component was reported .4 points above estimates. 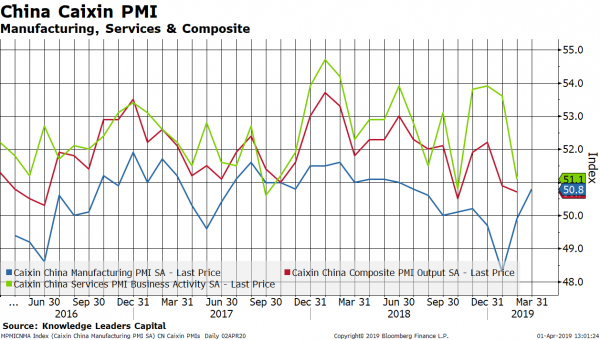 Then the China Caixin manufacturing came out Sunday at 7:45pm (mountain time), and again, we got a bounce and beat estimates by .8 points. 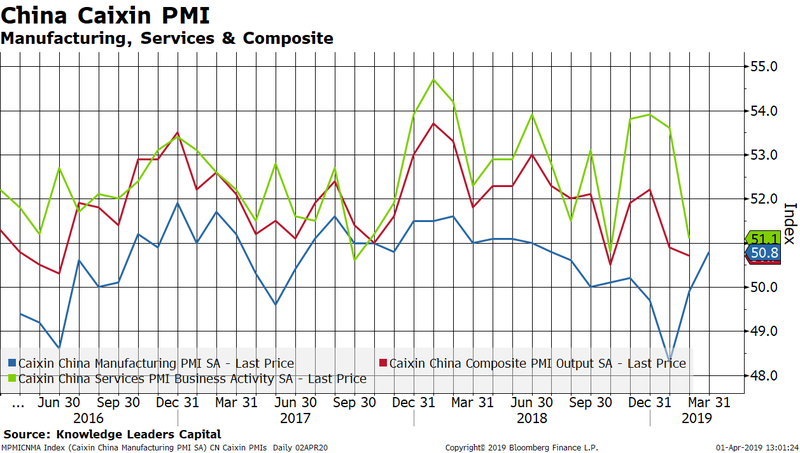 Most components of the Caixin PMI rose, though most sub-series aren’t much above 50. 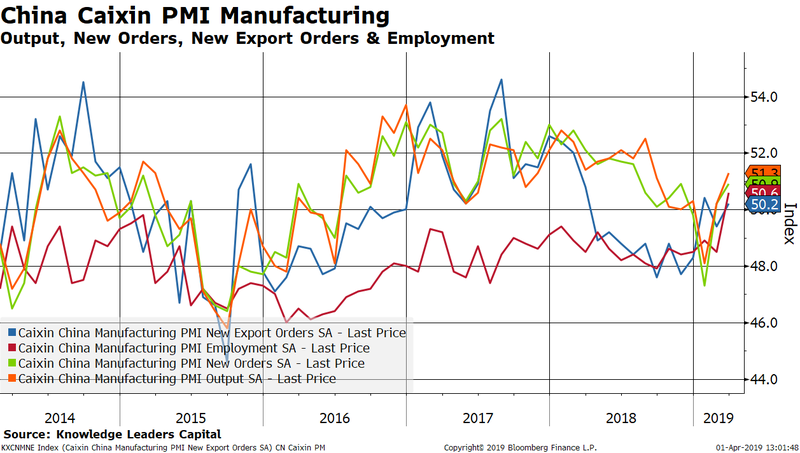 Output is the strongest component at 51.3 while new export orders increased to a still weak 50.2. 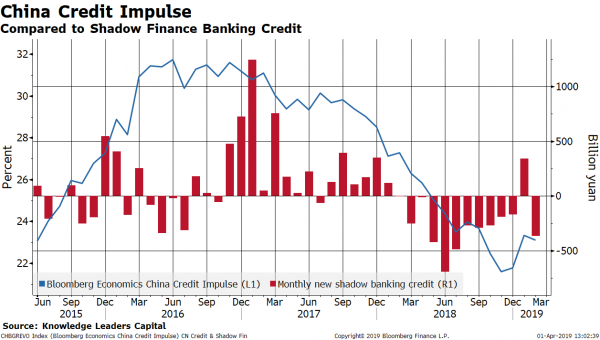 The increase in Chinese PMIs was surely expected after the surge in credit its bank pumped out last month. 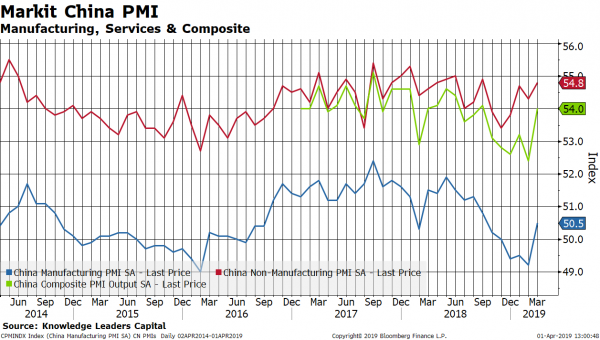 But, the one month surge in credit has now reversed, which doesn’t seem to augur well for a further rebound in manufacturing activity. Similarly, while we had a strong one-month jump in new shadow banking credit in January, in February it contracted once again, pulling China’s credit impulse down year over year. 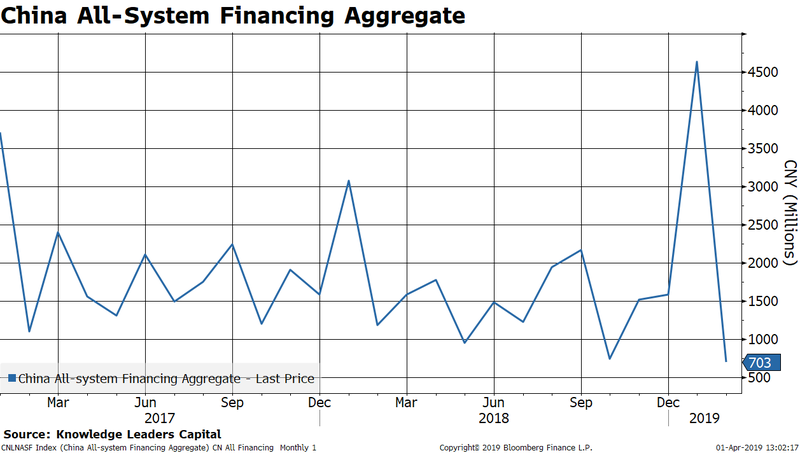 Continued tight credit conditions for small/medium sized businesses are likely the explanation why they are still contracting. 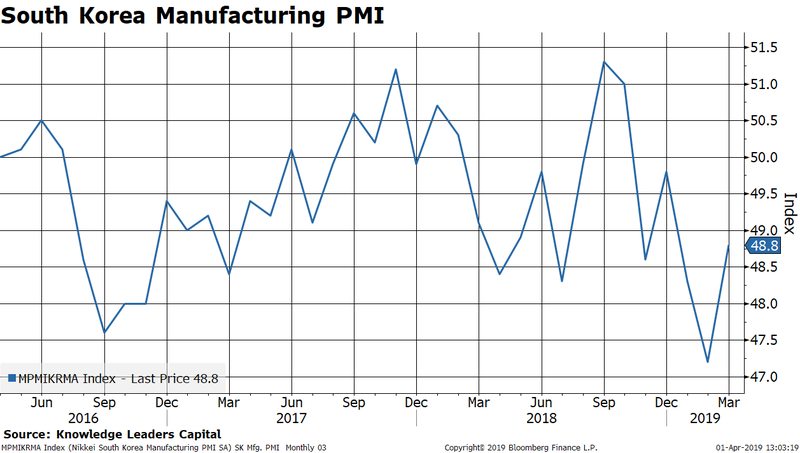 Small/medium sized business hasn’t had a PMI reading over 50 since May of last year. 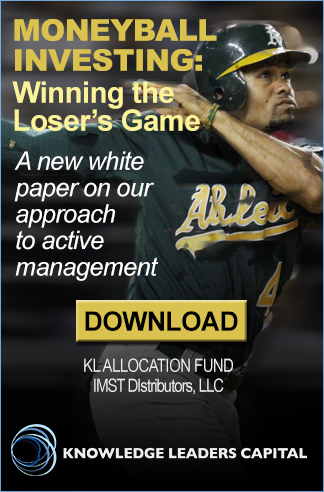 Clearly, any increment to activity is being driven by larger companies that can access state directed credit. That night, we also got some manufacturing PMIs for other Asian countries. Most showed a bounce but are still below the critical threshold for expansion of 50. 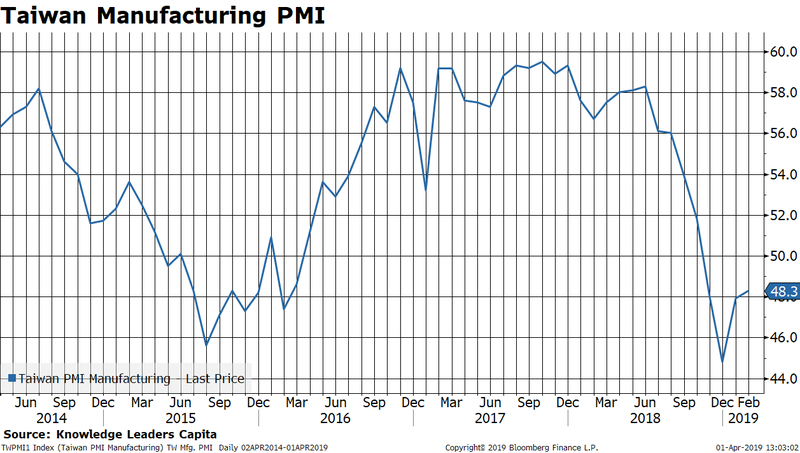 Taiwan, geographically the closest trading partner to China, is still experiencing a manufacturing contraction, with the PMI at 48.3. Given the concentration of global technology goods produced in Taiwan, this doesn’t bode well for the production of technology hardware. 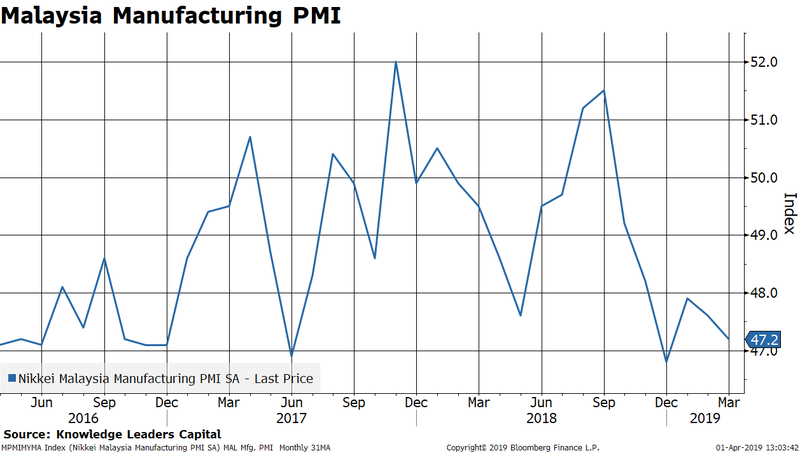 Similar story in South Korea, another major technology producing hub, where the manufacturing PMI is still contracting. 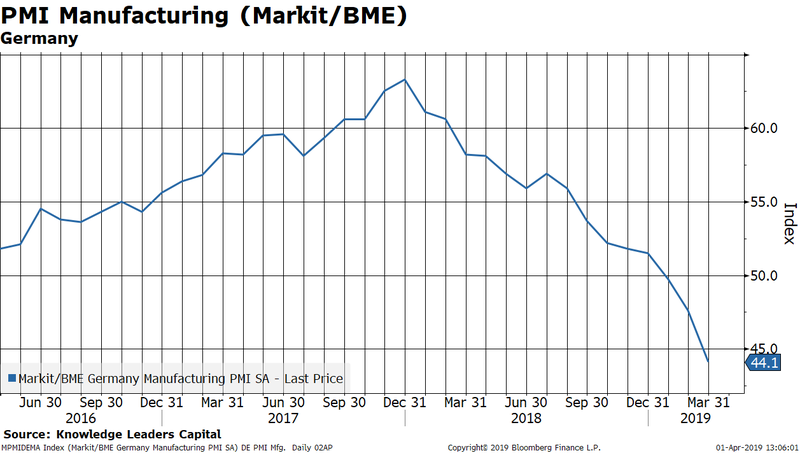 Malaysia’s manufacturing sector had a brief bounce earlier in the year, but has fallen back to 47.2, a moderate pace of contraction. Perhaps a reflection of the weakness in the Chinese manufacturing sector, but several weeks ago we noticed that Chinese fixed asset investment had dropped significantly through February. And then last week, we noticed manufacturing profits plunging in China, which fits with the retrenchment in capital spending. 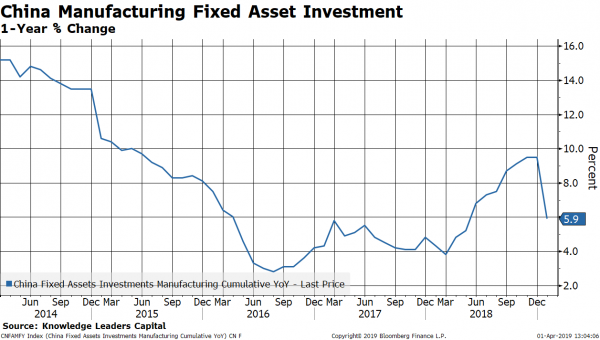 Japan is another economy central to the Asian supply chain, and if green shoots are emerging in China’s manufacturing economy, we would expect to see some confirmation here, but no. Sunday night at 5:50pm (mountain time) we got the Tankan business survey. 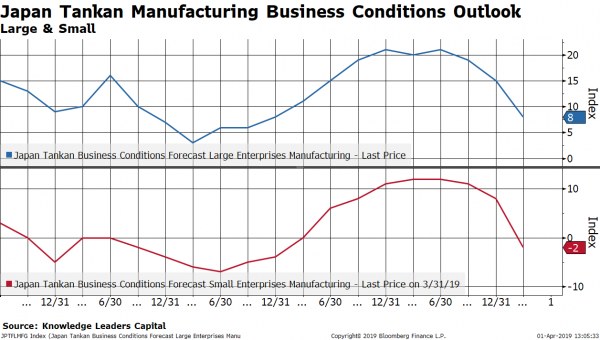 Expectations among small and large manufacturers tumbled. 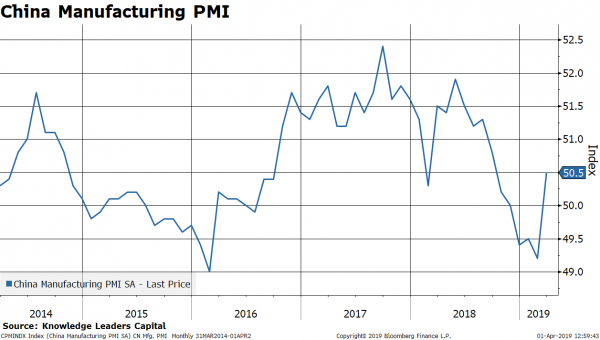 The survey for large manufacturers outlook was 12 and came it at 8. The survey for small manufacturers was even worse, with the survey at 6 and actual results were -2. 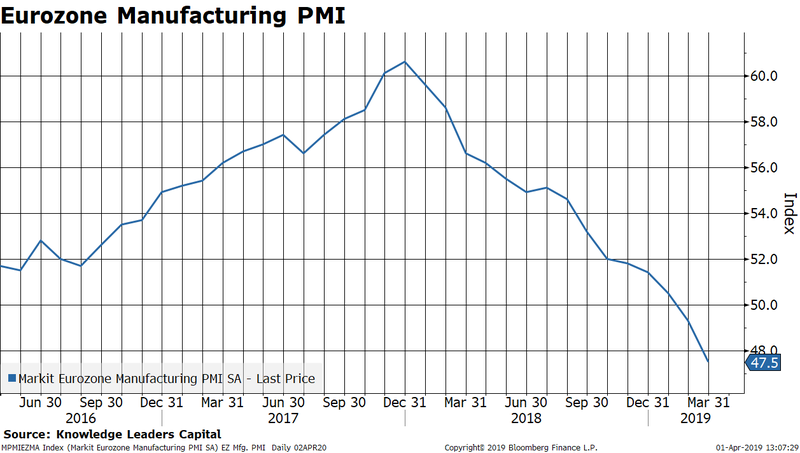 As Monday wore on, we got the Italian manufacturing PMI at 1:45am (mountain time), missing estimates by .1 points and well into contraction territory. 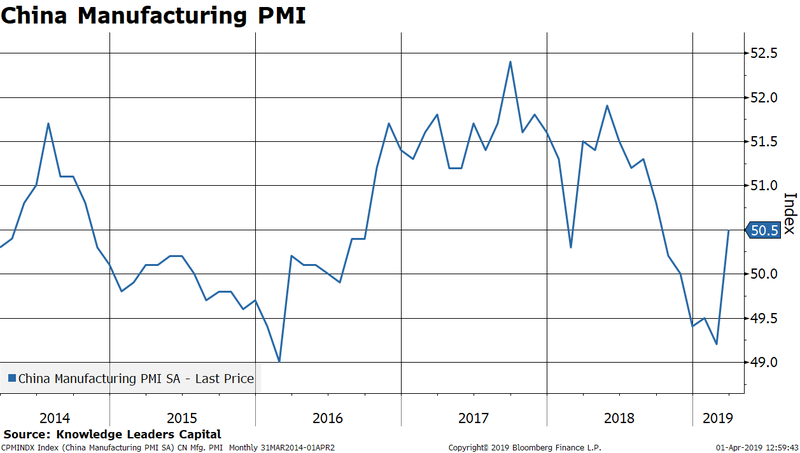 Five minutes later, we got the French manufacturing PMI, which missed estimates also by .1 points and is below the critical level of 50. Five minutes after that, we got the German manufacturing PMI, which came in .6 points below consensus and is far into contraction territory. 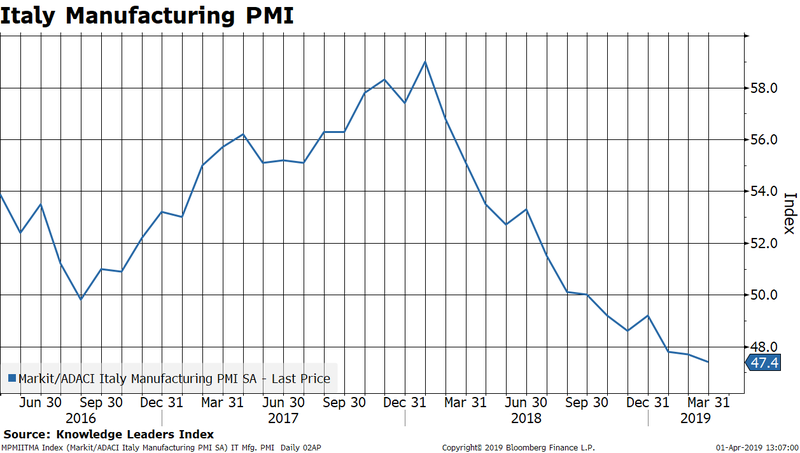 Lastly, at 2:00am (mountain time) we got the manufacturing PMI for the Eurozone overall. It missed estimates by .1 points and fell further into contraction territory. 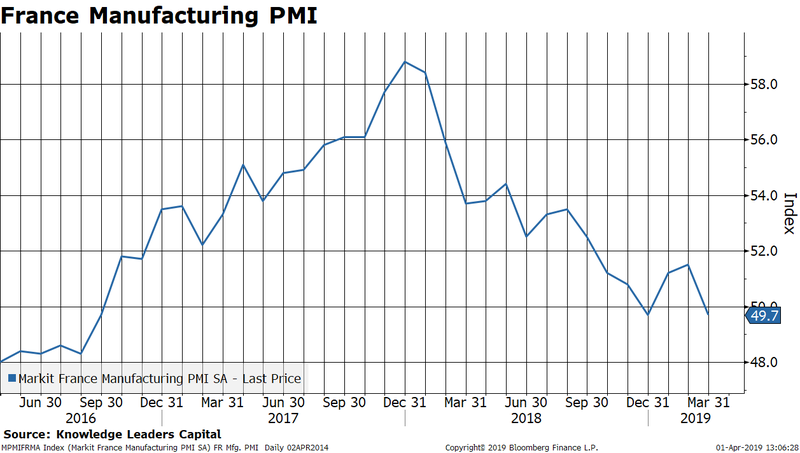 Clearly the rebound in China is weaker than one would have hoped given the stimulus thrown at the economy recently. The surge in credit was short-lived and only seemed to help the bigger companies. Manufacturing in other countries in the Asian supply chain—especially technology heavy countries like Taiwan and South Korea—are still contracting. 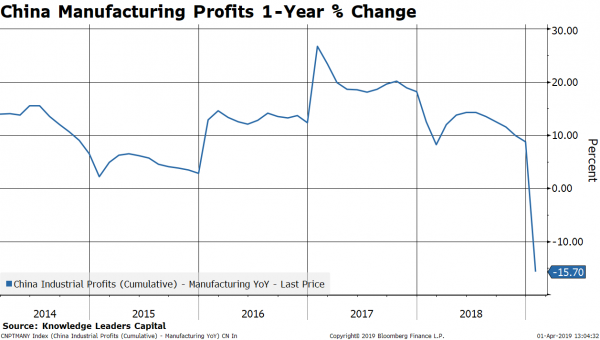 Japanese company outlook is dimming more quickly than estimated among both large and small manufacturers, raising a red flag. 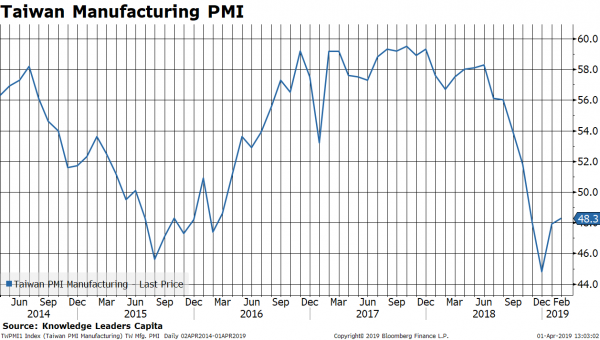 The largest countries in Europe are experiencing a manufacturing contraction, which is dragging down the whole of Europe into a potential manufacturing recession.